This time tied to the Jakarta 483rd Anniversary. 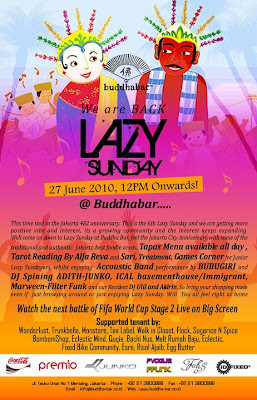 This is the 6th Lazy Sunday and we are getting more positive vibe and interest than ever. It's a growing community and the interest keeps expanding. 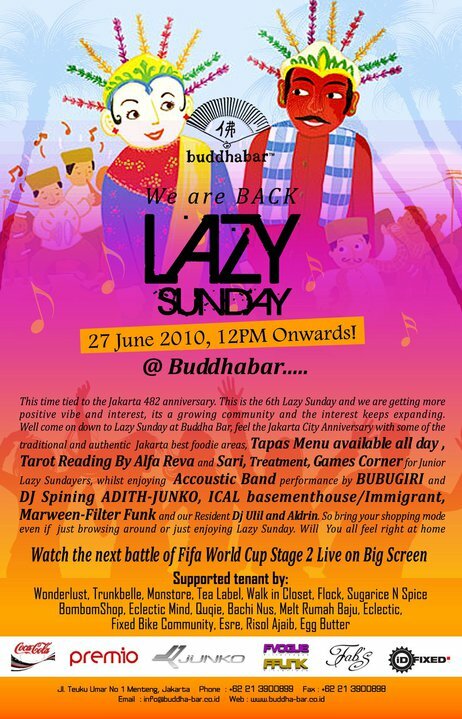 Well, come downto Lazy Sunday at Buddha Bar, feel the Jakarta City Anniversary with some of the traditional and authentic Jakartan best foodie areas, Tapas Menu available all day, Tarot Reading by Alfa Reva and Sari, Treatments, Games Corner for the Junior Lazy Sundayers, whilst enjoying Accoustic Band performance by Bubugiri and DJ's Spining Adith-Junko, Ical Basementhouse,Marween-Filter Funk and our Buddha Bar residents Ulil and Aldrin. So bring your shopping mode even if just browsing around or just enjoying Lazy sunday. You will all feel right at home. Watch the next battle of FIFA WORLD CUP 2010 STAGE 2 Live on Big Screen with Cinema Sound and many promotions! Wonderlust, Trunkbelle, Monstore, Tea Label, Walk in Closet, Flock, Sugar N Spice, Bombom Shop, Eclectic Mind, Qugie, Bachi Nus, Melt Rumah Baju, Eclectic, Fixed Bike Community, Esre, Risol Ajaib, Egg Butter. Sponsored by: Coca-Cola, Premio Magazine, The Beat Jakarta Magazine, Junko, Fvogue Ffunk, Fab's, IDfixed, Pernod Ricard, Evian, Skyy and any more.